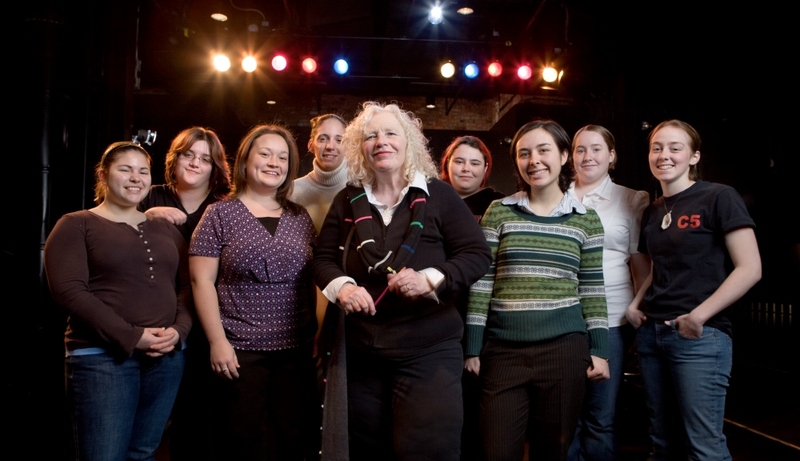 Susan Vick in 2008 in the Little Theatre, WPI’s first dedicated theatre venue, surrounded by undergraduate theatre enthusiasts. Susan Vick, who recently retired after 37 years as director of the drama and theatre programs at Worcester Polytechnic Institute (WPI), received the 2018 Leonidas A. Nickole Award from the New England Theatre Conference at the organization’s annual Excellence in Theatre Awards program yesterday. The award is given for outstanding teaching in the field of drama. “For nearly four decades, Susan built a remarkable theatre program, unusual in its scope and intensity of student involvement for a university known primarily for its programs in science and engineering,” said Kristin Boudreau, Paris Fletcher Distinguished Professor of Humanities and head of WPI’s Department of Humanities and Arts. “She has overseen a learning environment that gave maximum autonomy to students, inspired students who are typically not drama majors to invest intense amounts of time and energy into their studies, and helped students work quickly to stage high-quality productions. She graduated from Catawba College and toured with the National Children’s Theatre before becoming the first woman to earn an MFA in directing from Southern Methodist University. She held a number of academic posts, including serving as acting director of theatre at Bowdoin College, before returning to school to become the first woman to earn a PhD in theatre at the University of Illinois. A number of acting awards, more than 20 directing milestones, and a budding career as a playwright followed. new plays festival that Vick founded in 1982.
students deeper into the world of the dramatic arts as advisor to numerous undergraduate projects and by working closely with students who, inspired by her teaching, chose to major in theatre. She also found ways to engage WPI’s students’ technical and engineering expertise through the theatre productions she oversaw, which for many years involved designing and constructing elaborate stages and audience seating areas to transform the cavernous interior of the Alden Memorial great hall into a more intimate theatre venue. In 1996 she launched a formal Theatre and Technology Program to prepare students to pursue cutting-edge theatrical innovation and to bring new technologies, including virtual reality, to WPI’s own productions. an annual festival of original plays written by students and other members of the WPI community, to showcase their work. New Voices is now the longest running university new plays festival in America. In 2005 Vick realized her dream of having a dedicated theatre venue on campus when the Little Theatre opened in the lower level of Sanford Riley Hall. Created with a $400,000 grant from the George I. Alden Trust, the 100-seat theatre has a permanent lighting grid and sound system, a control booth, and a greenroom. In addition to the numerous plays directed at WPI, Vick has staged productions in Boston, Northampton, and Amherst, and brought WPI productions to the Edinburgh International Festival in Scotland. She has written plays that have been produced off-Broadway and in regional, educational, and international venues. She is a published poet and has adapted several of Shakespeare’s plays for children’s theatre. She has also served as editor for Playwrights Press, as well as in other playwriting venues, and has been a contributor to “theatre in review” in Theatre Journal.